Originally published on November 9, 2018 by BNP Media through the Building Enclosure Blog. Ventilation rates in our buildings can be a complicated subject and there is no shortage on ways to assess how air is brought into an indoor environment. Yet, a basic question that commonly emerges is simply: How much ventilation should I provide in a building? When it comes to defining minimum ventilation rates in buildings (except for low-rise residential), the premiere reference is ANSI/ASHRAE Standard 62.1, Ventilation for Acceptable Indoor Air Quality. The standard specifies minimum ventilation rates and other measures for both new and existing buildings that are intended to foster a level of indoor air quality that is acceptable to occupants and mitigates adverse health effects. The breathing zone is the region within an occupied space between 3 and 6 feet above the floor and more than 2 feet from walls or fixed air-conditioning equipment. If both sources are present and both (for example) produce perceivable odors, then the ventilation rate required for adequate dilution is the sum of the rates needed to handle each source separately. Thus, ASHRAE offers a combined outdoor air rate to simplify matters. For our purposes, we will measure the delivery of outdoor air in cfm/person based on the combined outdoor air rate. It is important to acknowledge that we are referring to outdoor air specifically. Most HVAC systems will recirculate some component of indoor air (filtered and reconditioned). An examination of the minimum combined outdoor air rates from Standard 62.1 reveals that ventilation requirements vary based on occupancy type, which impacts expected activity level (think heavy breathing and perspiration) and the potential for indoor pollution sources. 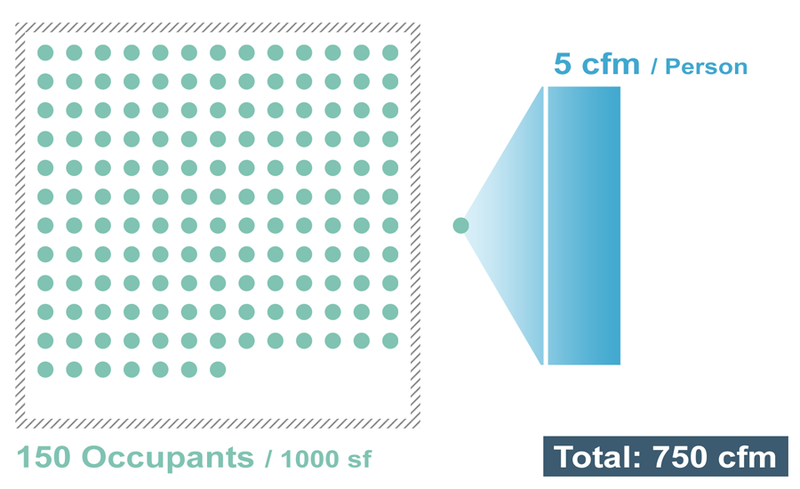 For example, museums/galleries require a minimum combined outdoor air rate of 9 cfm/person, while animal areas in pet shops or weight rooms in health clubs require no less than 26 cfm/person.